Even 20 years ago, dress codes were much more defined and people clearly understood what they meant, however, in recent years, fashion and clothes have become more casualized and because of that, new dress codes have evolved. The term casual today can be anything from gym clothes or athleisure, all the way up to something that’s office appropriate such as a dress shirt and chinos. Now obviously, there is a big disconnect and just having the casual dress code is no longer enough. So if you get an invitation with a dress code smart casual, I hear your pain. Historically, the term was coined because people showed up overly casual and the smart implied that you can’t show up with joggers and trainers. If you look at the urban dictionary, it defines smart casual as a nonsensical dress code that people slap on to events, parties, and workplaces. Completely down to interpretation, this always causes confusion and often spectacular results. The mixture between smart and casual should not be taken literally. So while it’s hilarious, sadly, it’s not very helpful. First, the urban dictionary got it right by saying don’t take it literally. That means, don’t wear tennis shoes with a dress shirt, or combine sweatpants with a blazer. So in a nutshell, smart casual is not about mixing different pieces of clothing from different degrees of formality but rather to pick something that is in between a very casual outfit and a formal or businesslike outfit. A hoodie would be too casual and pleated wool dress pants would be too formal, instead, if you go with chinos, they are less formal, as well as a polo shirt, you hit that perfect sweet spot of smart casual. Personally, I like the idea of a smart casual dress code because it allows you to use lots of colors and to combine different things that you may not have combined otherwise. Ideally, you always want to avoid looks at the extreme end of the spectrum, that means no jeans, no trainers, no hoodies, or no sweatpants. At the same time, it also means no neckwear, no suits, no pleated pants, and no black dress shoes. Where Do You Encounter Smart Casual Dress Code? It’s not at the office because there are different terms such as business casual. You can usually find smart casual dress codes in a social environment such as cruise ships, restaurants, or resorts. The whole idea is to look neat and presentable without being overly stuffy. So let’s say you work in a white-collar office and you have an invitation to a smart casual event afterward and you usually wear dress shirts, ties, and pinstripe suits, you definitely want to bring a change of clothes. If you’re a bit more flexible at the office, you can get away with wearing a blazer and chinos for example, as well as a tie, but when you go to the smart casual party, I suggest to take off the tie, add a bold pocket square, maybe a boutonniere, have some bolder socks and shoes and brown tones or more colors such as dark red, dark green, or navy, and it just creates a more fun outfit that is not as boring or stuffy formal as you would usually know from an office environment. Should You Dress Up Or Down? So if you’re unsure whether you should dress up a little more or dress down, I suggest you always dress up because that way, you don’t embarrass yourself. Of course, always stay within that smart casual range which means below business wear. On the formal side would be an odd jacket or a blazer. Odd jacket meaning it has a bolder pattern, another color, and it doesn’t match the pants. You don’t want to wear a suit, a combination at most. Also, that means, don’t wear orphaned suit jackets from your pinstripe suit with a Nantucket red pair of pants because it’s simply odd and doesn’t work together. When it comes to shirts, you should definitely stay clear of t-shirts but you can wear dress shirts. That being said, I suggest not to wear plain white or solid light blue dress shirts because they’re true business formal. Instead, go with checked shirts in a collar. You can also go with bolder checks, smaller checks may be a small houndstooth or a bolder stripe. It all works, just make sure there’s some contrast, there’s some color, and it’s not too stiff. If you live in a warmer climate, linen shirts are perfectly fine. Personally, I would always stay clear of short-sleeved dress shirts and instead go with polo shirts because it’s more natural and works better. When it comes to pants or slacks, don’t wear jeans and don’t wear pleated pants made out of worsted woolbecause that’s office wear and both of them are too extreme. Instead, go with chinos, maybe corduroys in the winter, seersucker or linen in the summer or something with a bit more texture that’s interesting and it could also have a pattern such as a small houndstooth for example. When it comes to accessories, color is your friend. You can be much bolder than at the office and you can experiment and simply have fun. I suggest you skip bowties and regular neckties. if you want to have something around your neck, maybe an ascot can be the perfect item. If you decide to wear a blazer or an odd jacket, I strongly recommend you wear a bold pocket square or maybe a boutonniere that is just contrasting, it’s a pop of color, it’s different, and it’s fun. Definitely, avoid the white linen pocket square in TV fold, that’s fine for a job interview or the office but not for smart casual. If it’s cold outside and you need some gloves, I suggest to go with fun colors such as dark green, maybe a light tan, blue, or red, and stay clear of the traditional black gloves, or just boring brown gloves. 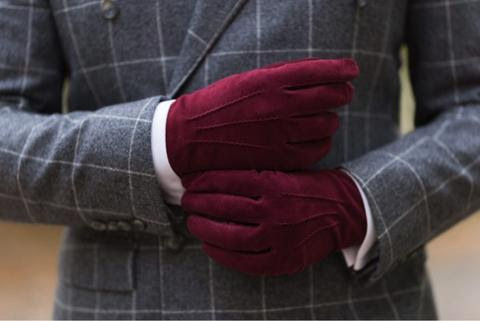 That being said, if you want to stick with those colors, make sure you get two-toned gloves such as the black and red gloves by Fort Belvedere or the brown and blue gloves which are definitely not your Grandpa’s gloves. When it comes to shoes, I suggest you stay with leather shoes. They can have a leather sole or a rubber sole but they must not be black because that’s too formal. Instead, go with brown tones or tans but you can also venture into green, maybe off-white, or dark burgundy red. All these colors are acceptable but I urge you to choose a style that is more casual with more casual details. As such, spectators work. You can go with woven leather, or maybe a linen insert, suede is also good. Just get something that’s more casual than a traditional business shoe. That being said, derbies are more appropriate than oxfords but there are oxfords that would be just fine for smart casual as long as they are not too dark and they have maybe a full brogue pattern. Apart from that, I think two tone tassel loafers are great or maybe just regular penny loafers, some people even like driving moccs even though I think they wear very quickly if you wear them on a daily basis but they work from a concept point of view. On a very casual end, I suggest shoes go with boat shoes because they are still leather and they’re still relaxed and you can even wear them barefoot. While it’s clear that tennis shoes and trainers are too casual, a lot of people like designer sneakers or leather sneakers and in my opinion, they’re in a gray area. Personally, I wouldn’t wear it because I find it too casual but I know other people who would probably find a sneaker still appropriate. At the end of the day, it’s your call. Personally, I’d always urge you to get a little bit more formal within the smart casual dress code because that way, you always look dapper and properly attired. No one will turn you down, everyone will respect you, and they will know that you understood the smart casual dress code.